Hello! So what do you think of all the new products released this month at Taylored Expressions? So fun, right? 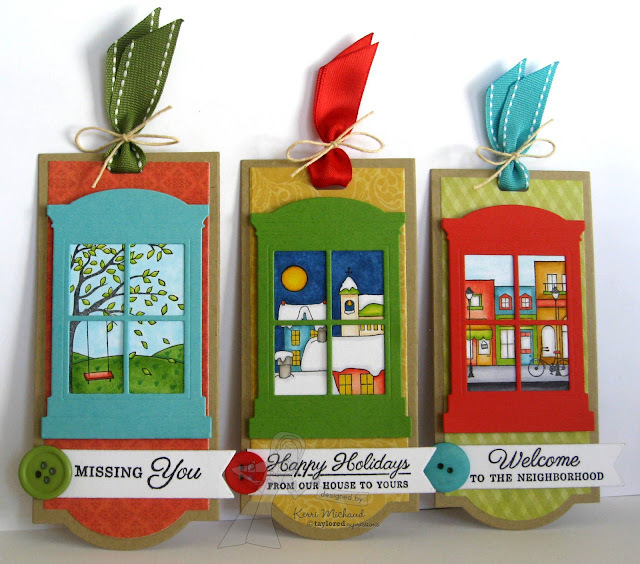 Today I have some tags (or bookmarks) to share with you that I made using the new From My Window Stamp Set, the Arched Window Die, and the Banner Stacklets 2 Dies! 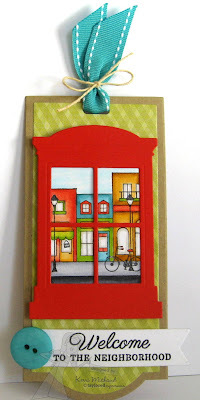 I used Kraft cs for the base of all the tags and the dp is My Mind's Eye Collectable Notable which you can find HERE! All of the images were stamped with Memento Tuxedo Black Ink and colored with Copics. The sentiment panels were cut out with the Banner Stacklets 1 Dies. Well, I hope you've enjoyed this release! Make sure you check out the rest of the Baker's Dozen Blogs for more spotlights and have a fabulous Friday! Kerri - your tags are awesome! As always, your coloring is beautiful and these make such a great set. I think they should be hung up on the wall! Wow! These tags are darling, Kerri! Beautifully colored, what a pretty collection you've made! Absolutely wonderful!! So creative and so so pretty! Fun release!! What an awesome use of these dies together, Kerri! As usual you've combined everything perfectly! Love the color combos on each one and the coloring is beautiful! I especially love the snow-covered roofs in the dark of night!! LOVE these tags! How awesome! I love your window cards and tags! So neat! These are so pretty! What a great die.